Congolese writer Alain Mabanckou discusses his work and how immigration to America impacted his writing. 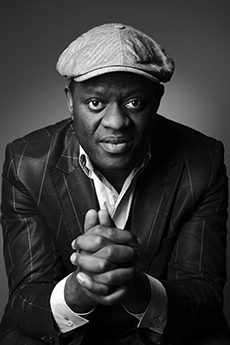 Born in 1966 in Congo-Brazzaville (French Congo), Alain Mabanckou has been named by the French magazine Lire as one of fifty writers to watch out for. Called “the African Beckett,” he is the author of several prize-winning novels including Memories de por-epic (Memoirs of a Porcupine.) Blue White Red was the winner of the Grand Prix Litteraire de l’Afrique Noire. He is Professor of French and Francophone Studies at the University of California, Los Angeles. Alain Mabanckou was invited to Houston by the Cultural Service at the French Consulate in Houston, and supported by the Cultural Service and the University of Houston. While he was here, I had the opportunity to sit down with him and Sylvie Christophe, French Cultural Attaché, at Houston’s Bistro Menil to talk about his life, his work, his admiration of James Baldwin, and the idea of African literature. Mabanckou, wearing what seems to be his signature hat, was a delight to speak with: warm, gregarious, and interested. After telling him how much I’d enjoyed reading his novel African Psycho, the interview began. Let’s start with what you grew up reading: I’ve read that you went to public schools, that your teachers were white and you grew up reading classic French literature. What were you reading and what did it mean for you? Were you able to “relate” to it or was it too foreign? I’ve read that both Rabelais and Celine were influences – are they still? It was because I was the only kid of my parents, reading was the only way to escape from the loneliness. I was like someone who was spending a lot of time at the library; reading was for me the way to open my eyes to the world, and at the same time the way to maintain my French culture. We were colonized by France, and reading was a kind of requirement in order to be someone in the society. So I knew that the only way to escape from my situation, from the fact that we didn’t have anything, was to read, to become someone involved in literature. It was French literature that I studied at school, but at the same time I would read literature from the world, by way of translation. I read at that time Hemingway, Steinbeck, it was all in French, so at that time I was thinking all those writers were French! When you are a kid you don’t see who translated the book, you just read and think that it’s literature. I think at the time that it showed me that literature does not have boundaries, it kind of is a door that opened and I was just trying to go forward. I like Rabelais for his exaggeration, you know, when you read Broken Glass you’ll see how I was influenced by Rabelais…by Celine…Rabelais focuses on the details of the life, he’s like someone who used the popular language, and that’s very important for me. I often say that Celine is like an African when he’s writing, he’s trying to put everything into the world, he’s dictating everything into it, and when you read him, you realize how he had the power of language — that was a nice shock for me. Who were the African writers you read that helped you to discover what African writing could be? Mainly it was Camara Laye, The Dark Child, because it was the first time for me to read in an African novel someone who was talking about his own biographical experiences. He was talking about African families, he was not just writing against the whites, or against France because of slavery or because of colonization, he was someone who was trying to depict life, how Africans were living, how the cultures in Africa work, it was a nice surprise for me. There’s a Senegalese writer, Cheikh Hamidou Kane, he wrote Ambiguous Adventure, which is about the clash of civilization between Europe and Africa, how Africans who have African cultures deal with the European culture at the same time. Both Lay because of the picture of African life, and Kane because of the clash of cultures, they did help me to understand Africa very well. So did Francophone – Amos Tutoula’s Palm Wine Drinkard – it was also important for me…because Celine is close to Tutoula. I’m curious – I’ve also read that you studied law and then went on to work in corporate law – what inspired you switch careers? Was it always something that interested you? I went to law school to fulfill my mother’s desire. She wanted me to become a lawyer. My father was a clerk, a receptionist at a hotel, and he would bring books home, and I would read those books in order to grow. It was my mother’s desire, she told me “I don’t want you to become a professor, because professors don’t have money.” So I went to law school, and before that I got a degree in philosophy; but once my mother died, I said since she’s not here to see me become a lawyer (laugh), so I started writing, writing, writing, until I was hired at the University of Michigan first, and then I went to Los Angeles. When people say African literature, it’s very wide, because it’s not a country with one culture, it’s diverse. You have a diverse literature, so I’d say instead “African literatures,” which is going to be very open, it’s going to be very diverse. At the same time, the term which bothers me a lot is saying that it’s Francophone literature – are we going to put French literature in front of Francophone literature? I am a Francophone writer, as well as Michel Housellebecq would call himself a writer of French literature. This distinction is not correct – we publish at the same publishing house, we write in the same language; what is different is just the background. Even in France, if you are a writer in Marseilles, you don’t have the same background as someone from Toulouse, from Paris, but you’re still labeled as French literature. Do you feel that being labeled an “African” writer limits what you’re able to write about? Yes, in a way. Because when you are called an African writer, people are expecting you to write in some way, so if you are writing about the snow, or about Europe, people say “no, no, no — your mind is not that African.” So my goal is to break those prejudices to explain to people that you have to give a break to African writers, they can write about anything. If I want to write about something in Houston without the black commentary in my book, I will do so. Like James Baldwin in Giovanni’s Room – there’s no black, there’s no Harlem, nothing! So I’m like someone who’s requesting the freedom for African literature, we need the freedom to write about anything, as long as it is in our experience. What preconceptions do you see the rest of the world as having about African literature? And his response was: It’s not just the rest of the world. Africans have often incorporated some of these prejudices. One of them is that Africans are supposed to talk about Africa. That’s a stereotype of Africa, you don’t think that it’s a problem that an American writer will write about India or Europe, or some other place, we think that it’s natural that someone from America is doing research in Africa about topology or sociology, but it’s strange that an African guy would come to America and do anthropological studies, and so we have that deeply rooted in ourselves. You expect that from an African author you will have authenticity, and that’s something you don’t ask for from a European writer or any other writer. But that’s slowly changing. We are becoming free of that imposition or stamp of needing poverty and huts, or even worse, witch doctors and dancing around the fire. We see the reaction when people go to Cape Town or Nairobi or Johannesburg and they say “this is not Africa.” Why can’t we have the right to have diverse urban areas? I agree with him – he’s a great writer and I know him very well. He’s white and Lusophone – he’s an example of the diversity of Africa. It’s a big mistake to expect an African to write only about Africa. There’s a Kenyan writer who tracked the prejudices about African literature by reading African novels, and learned that readers expect that the writer will be describing the life in Africa, describing starvation, colonization…but at the end of the day, as an African writer, if you don’t prevent yourself from these kind of prejudices, you are not yet a writer, you are just someone trying to confirm what people are already thinking about Africa. The great writers, the ones I like, are those who break those prejudices, so I agree entirely with Mia Couto. And I would add that things are changing, because Africa is not so far like in the 20s, when we were dreaming about animals and suffering and Kenya. Nowaways, people have cell phones, android, computers – people know what’s happening in the United States, they’re listening to American music, they’re wearing [Houston] Rocket’s t-shirts, they can discuss with you about the last confrontation between the LA Clippers and…it’s incredible. You don’t need to leave a country in order to become American, just from there, they can see the world. And maybe the literature is following that metamorphoses, it’s becoming what we used to call “world literature” in France. In fact, France is no longer the center of literature written in French. Nowadays, if you want to understand the literature being written in French, you have to read African literature, literature from Belgium, from Quebec…those people, if they’re writing about their own country, they’re also writing about France, they’re writing about the Francophone world. In an interview about Memoirs of a Porcupine you said, “In this book, I wanted to recall the oral nature of the tales and legends that I heard during my childhood in Africa. “˜Memoirs of a Porcupine’ is a book written in an African oral tradition where the spoken word is more important than what is written,” Can you tell me more about the oral tradition, YOUR use of the oral tradition, and whether that is getting lost with technology, urbanization, etc. I think it’s not going to be lost as long as put those traditions in our writing. Today, if you are writing a text in your cell phone, you’re going to have a kind of popular language in it. In Memoir of a Porcupine – it was a recall of oral tradition from Africa, stories I heard from my mother — but I was also influenced by La Fontaine who also wrote a lot of fables. So the quotations, the fact that I took the opportunity to talk about animals, and before La Fontaine there was Aesop, so there was the African oral tradition, and there was La Fontaine and Aesop, that gave me something else, something new. Plus we know that when you are reading La Fontaine, you are going to understand that even in Europe they had an oral tradition – it’s not just an African thing. So I tried to make a connection from my reading of La Fontaine and the stories my mother had told me. Urbanization is going to hurt, because the world is changing, all those old people who have the knowledge don’t have access to the new technology, so that’s the problem. So we have to find a way to get to them – how to make them speak so the stories aren’t lost. They need to be interviewed, filmed, because you’re not going to say to an old man go to Google…the only way is to make them sit and then they’ll say everything about the culture. I know that James Baldwin is one of your literary heroes – how did you discover him, what was your immediate reaction on reading him, and what has he meant for you as a person and as a writer? I was hesitant to go to school to learn English, so I would read all the James Baldwin works in English with my dictionary by my side, so I would read them and I was so thrilled that after reading him I read him in French, and then I realized that his life was exceptional – escaping from segregation here, living in the south of France, writing about civil rights, the clashes with other white writers…I read him and said to myself (the first one I read was Giovanni’s Room) that’s what I want to do. So in 2007 I wrote a book Letter to Jimmy that’s coming out in English next month. I think that he inspired me a lot in the way of being irreverent, of being free, of writing about anything I wanted to write. What shook me about Giovanni’s Room was that even though he was black, he was writing a novel that was occurring in Europe, with white characters, and is talking about homosexuality with a kind of freedom in the 1950s that nobody else was doing. That’s why he was kind of my mentor in literature. Living in the U.S. now, how does the distance from Africa change how you write about it? I came here in 2002, so it’s possible that it has affected it. But at the same time, I’m happy to see a reader from Congo telling me that “how can you describe the Congo with such accuracy whereas you’re not living in the country?” That was one of the greatest compliments I’ve ever had from someone – it means that even if I’m living far from home, that I’m trying to show them what was my Congo at the time. So even if I’m here, I still have my picture of Congo in the 70s and 80s, but, from time to time I go back to Congo to get a fresh picture. At the same time it’s a way for me to bring Congolese culture into the world culture. How widely used is French in Congo? Are you, in effect, translating the Congolese experience into French? And given that, tell me about the difficulties of translating your work into English. I write in French, but my accent, the way I’m phrasing, the way I’m depicting the character is Congolese. It’s difficult to translate – I’m lucky to have good translators. English is not the most difficult language to translate my books into – mainly it’s German. I wasn’t translated there for ten years because they say my writing can’t fit the German language. But finally I found a new translator who did the job. In English, if you’re missing something it’s maybe just…10%. That’s the main problem of the translation if you take the culture away – if you take Salinger into French, we’re going to be missing something. Something is going to be lost in translation, but the most important thing is to keep the substance, something that keeps the strengths of the novel whole. And finally, who are the writers from Africa that you’d like to see get more attention (besides yourself of course) here in the States? Uzodinma Iweala who wrote Beasts of No Nation he needs more attention here in the United States. And all those African writers in France who haven’t been translated and need to be.